WRESTANGEL is a fast paced, interactive game up to 5 players with 2 warriors each, up to 10 players with 1 warrior each. All cards have double use: they can be used to Move, Fight, Avoid hits, play Special Actions OR to Pin an opponent down on the ground for the three seconds count. It is up to you to balance them well: it is unuseful to Throw down an opponent if you are not able to Pin it: One, Two... THREE!! WRESTANGEL Complete Card Game 2-10 players, 6 years and up. 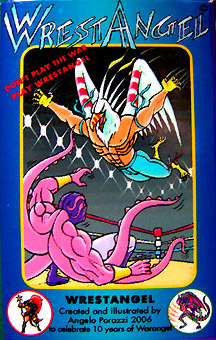 This is a game I heartily recommend to others (regardless of their interest in pro wrestling), and I can’t imagine turning down a game. As with Porazzi’s other games, it’s obvious that a lot of thought and play-testing went into this game. It's so much fun to play! The result for gamers is simply a good time.